Marinda, Milli's loving mother, tenderly holding her little body for a final time before placing her into the casket. Briton, her soon to be 4 year old brother, volunteered to say a final prayer before closing her casket. Just Milli's immediate family and grandparents were present. As Briton pointed out after his prayer "that was a long prayer." He appropriately prayed for each of her family members and for Milli. He also included a sweet 3 year old's petition that he wouldn't be scared of monsters under the bed. Mike, her father, lovingly carrying her casket from the hearse to her grave, to be buried in the same plot as her sister Hope. Hannah, her 2 year old sister, taking a rest from her busyness by sitting on her little casket. Briton, curious to see how her casket would be buried asking to see the hole, which led to Mike placing her little casket in the ground. Abby, Milli's 6 year old sister, carefully arranging silk flowers on Milli's casket just prior to it being covered with earth. Amelia Grace "Milli" Wessman was born on December 14, 2012 to Marinda and Michael Wessman in Lansing, MI. 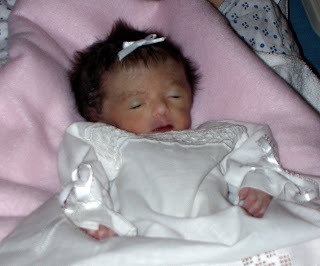 Prior to her birth, Amelia was diagnosed with the chromosomal disorder Trisomy 18. We are grateful for the important influence Milli has had and will have on our family. We look forward to being reunited eternally. Amelia was preceded in death by her sister, Hope Elisabeth, who also had Trisomy 18. She will be missed by her parents and siblings: Abigail, Briton and Hannah of DeWitt, MI (formerly of Murray, UT). She is also survived by her grandparents David and Kaye Wessman of Washington, UT and Patrick and Adele Casaday of Sandy, UT. A viewing will be held at the Jenkins-Soffe Mortuary in Murray (4760 S. State Street) on Thursday, December 20th from 6-7:30 p.m. A graveside service will be held at the Salt Lake City Cemetery (455 North and 980 East) on Friday, December 21st at 11 a.m., where she will be buried next to her sister. In lieu of flowers, we invite friends to visit www.ameliawessman.net for charitable donation ideas.